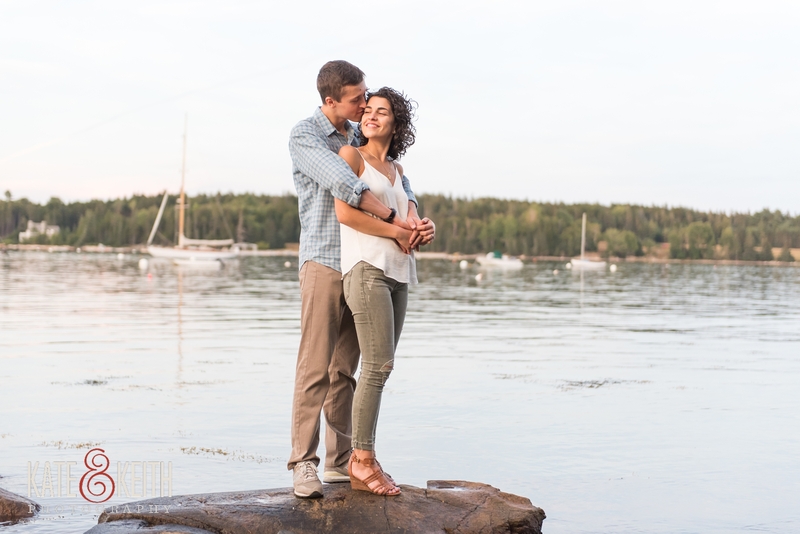 When Ben reached out to us to photograph his Acadia proposal, he confided that he and his soon-to-be-fiancee, Alyssa, had never been north of Portland on any of their trips to Maine. Never having visited the park, he was eager for some help in the planning process and we were more than a little excited to dig into our deep well of Acadia knowledge to come up with something unique for them! 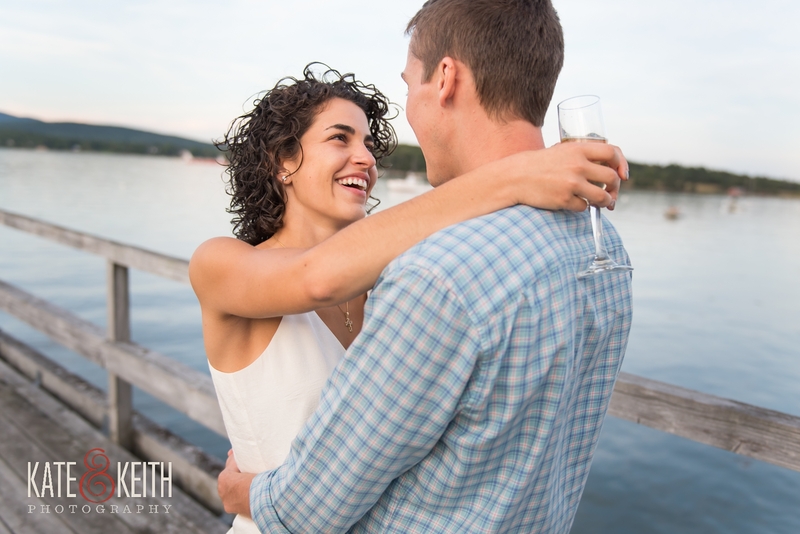 After sending along photos of a few places we knew of that had the privacy and proximity to the water that Ben was looking for, we settled on a private hotel in Southwest Harbor. While the hotel and grounds are private property, the owners are old family friends, so we were able to get permission to be there (one of the perks of working with an Acadia insider!). From there, we set up a plan with Ben and waited for the day to arrive. When it did, we were treated to a beautiful late summer day. Keith was staged as a kayaker paddling around the harbor, while I was sitting against a boat on the dock pretending to read a book. After two hotel guests cannonballed into the ocean as a jet-lagged wake-up, the scene was set. Enter Ben leading Alyssa to the end of the dock. Exactly as planned. 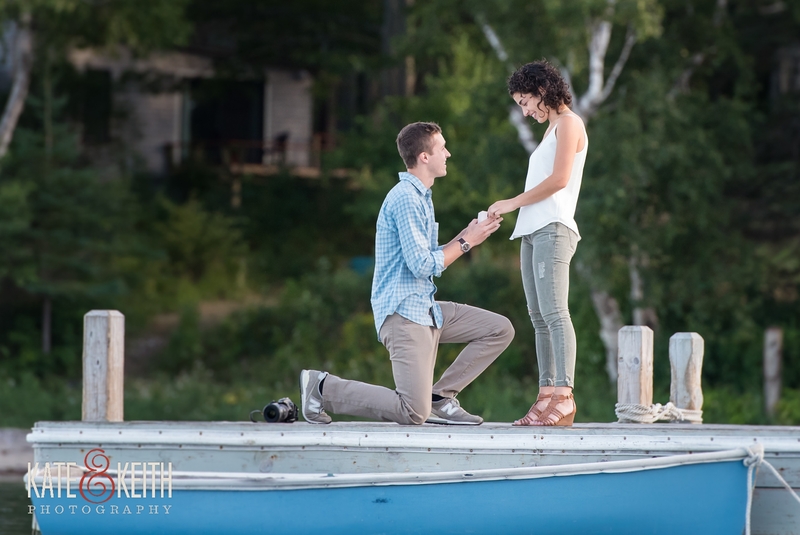 We positioned ourselves and pulled out our cameras undetected as Ben got down on one knee and proposed to Alyssa. She said yes!! After they took a moment to absorb the moment together, we pulled out the chilled champagne Ben requested for a celebratory toast! 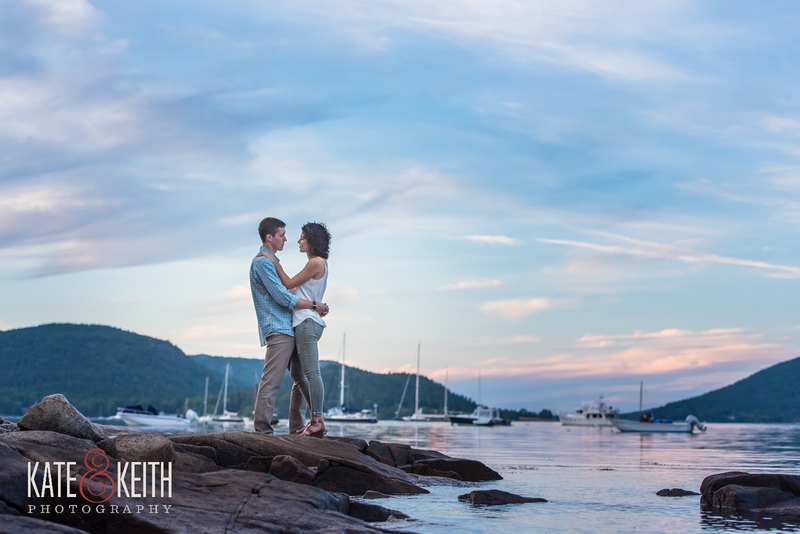 With Acadia National Park as the backdrop, Ben and Alyssa hopped into a boat for a few playful images on the water (we have the most adventurous couples!). They didn’t even mind that there were no oar attachments, as it turns out, Ben has some history and skills with boats! 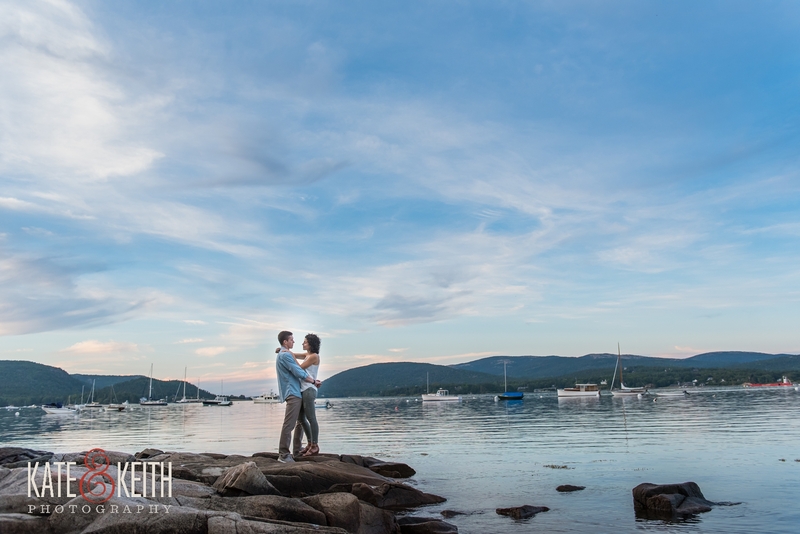 As the sun began to drop and the skies shifted into gorgeous color, we moved to a little outcropping by the water that we knew would be perfect. 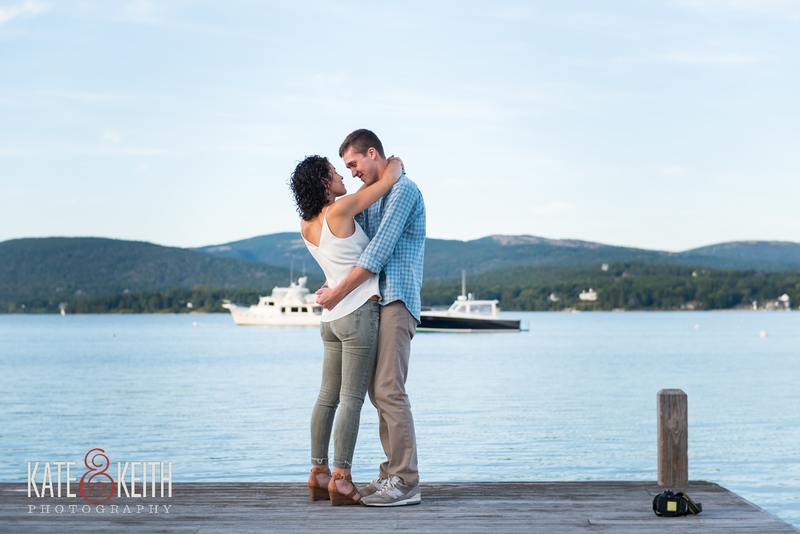 From there we were able to shoot some quintessential Maine photos of the newly engaged couple along Somes Sound with Acadia’s mountains in the background. It’s this kind of view that inspires so many of our couples to propose here and one of the many reasons we love this place so much. 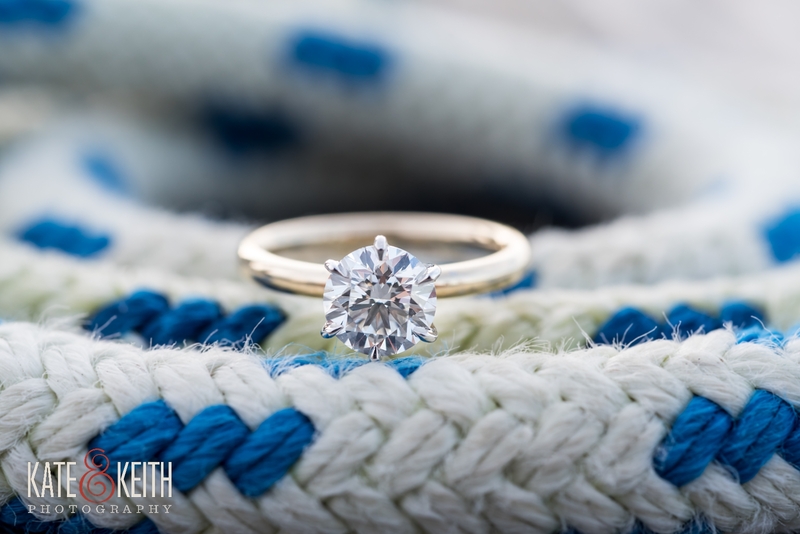 We had so much fun helping Ben plan his perfect surprise Acadia proposal. Using our experience and love of the park that we’ve accumulated over years and years of exploring! Celebrating with a little champagne by the water! The sky went all pinks and blues at sunset! Quintessentially Maine with the sailboats of Southwest Harbor and the mountains of Acadia National Park in the background! It really is our favorite place on the planet and certainly one of the top National Parks in the country! Our process for Acadia proposals starts with getting to know the proposer and understanding what their vision of the event is. 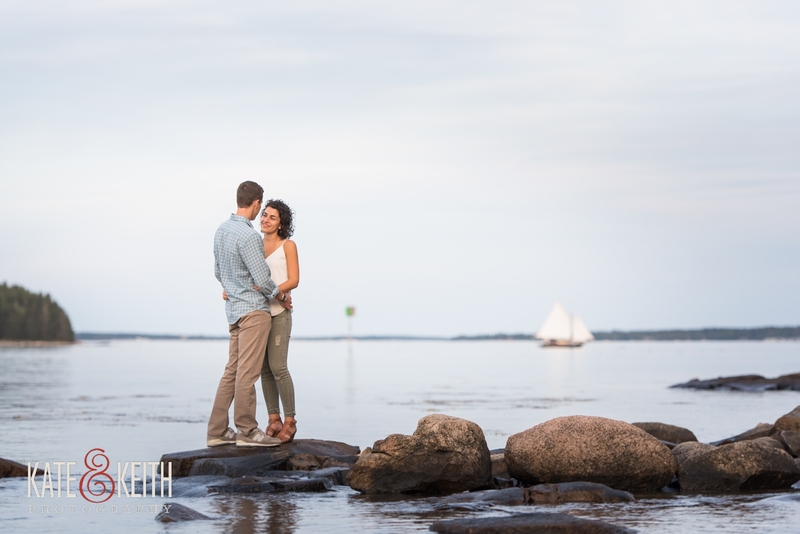 We’ll then work with you to find the best location and time of day to propose in Acadia and work with you in any way we can to help with the remainder of the planning and keeping it a secret. 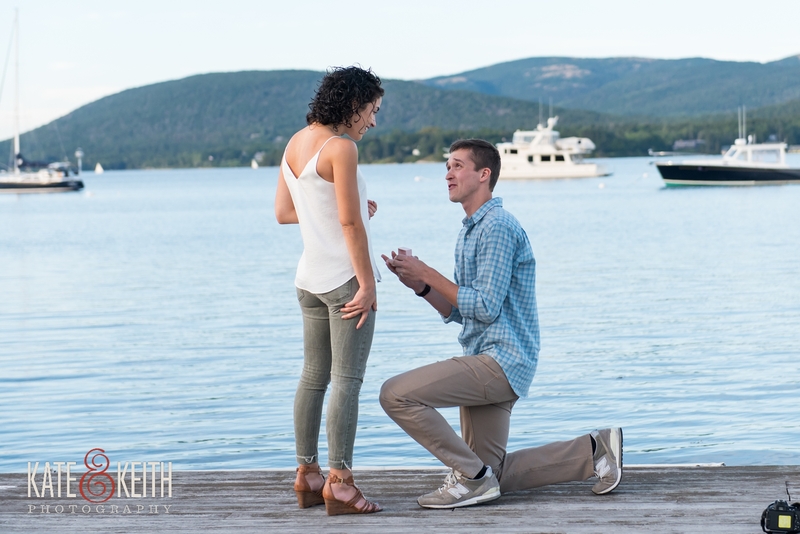 If proposing in Acadia on Cadillac Mountain at sunrise is what speaks to you, then we’re all for helping you plan it. But often this idea has less to do with personal connection and more to do with not having a strong familiarity with the park. 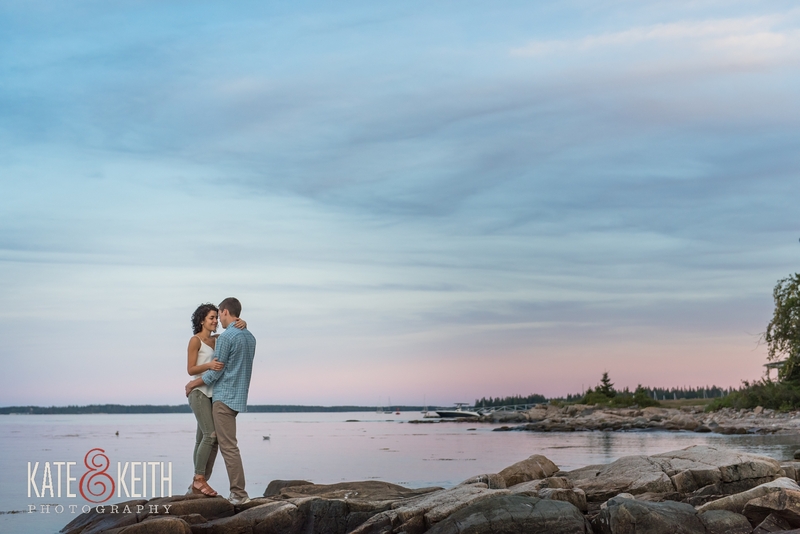 Kate has been visiting Acadia every year since she was a child and introduced Keith when they shot their first wedding together there. We now spend several months a year exploring the park while we stay at our family’s home in Somesville. 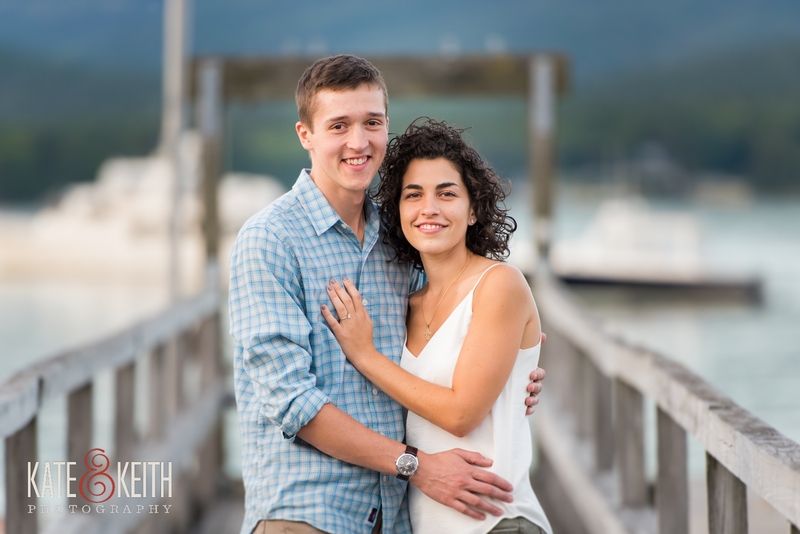 It is with this passion and knowledge of the park that we can find the perfect place for your surprise proposal in Acadia National Park and be there with you to photograph the first chapter in your wedding story. We intentionally don’t give out too many of our secrets here for the benefit of our couples. 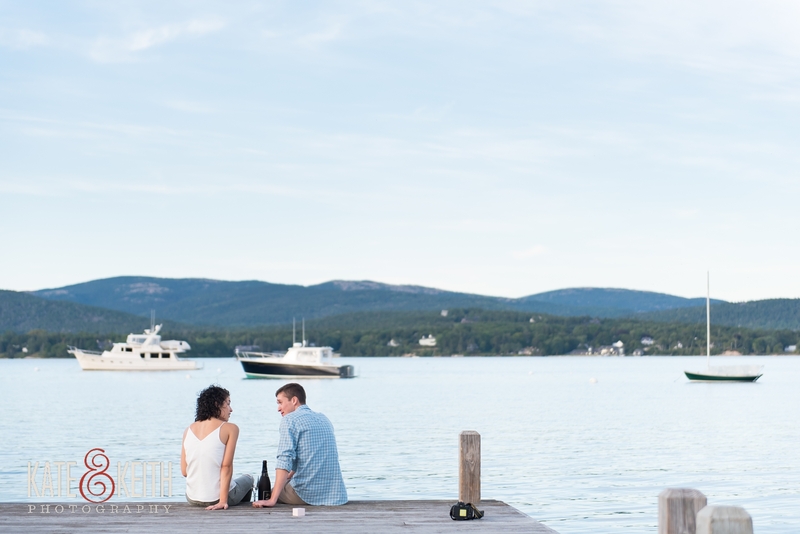 If you’re interested in working with us to photograph your Acadia proposal we’d love to chat with you! Let’s start making plans! Contact us now! 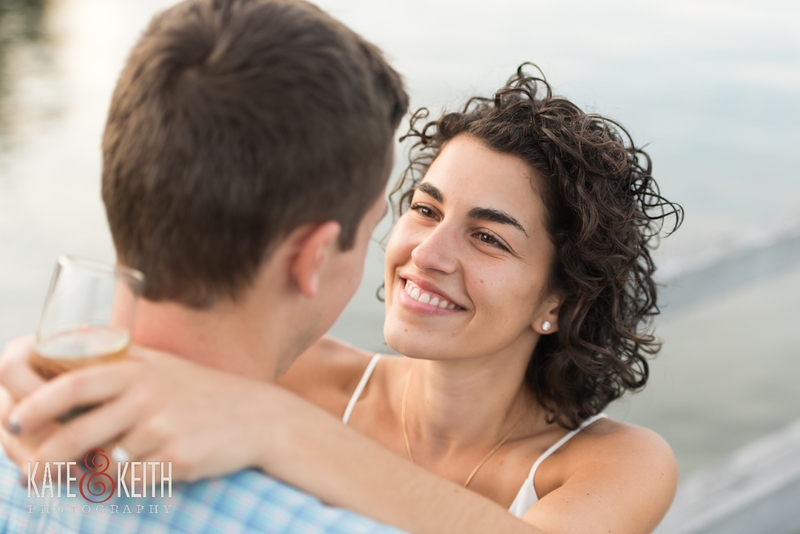 Watch Ben & Alyssa’s Ingtagram story in our Highlight Reel!